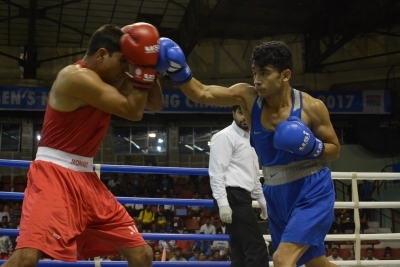 Visakhapatnam, Oct 25 (IANS) Assams Shiva Thapa underlined his class at the Elite Mens National Boxing Championship, defeating Tripuras Naveen Kumar 5-0 in the lightweight (60 kilogram) category here on Wednesday. Former World Youth Champion Devendro Singh (Manipur) also eked out a 5-0 victory against Arunachal’s Kumar Beyong to advance into the next round of the flyweight (52kg) category. In the 60 kilogram bout, the onus was on World Championship medallist Shiva to show the way. He began in his typically aggressive way, attacking from the word go in the opening round. The next round saw Naveen land a few punches of his own but Shiva remained steady and counter attacked with speed and agility. That put the brakes on Naveen but the bout still went into the third round. By then, however, Naveen had started feeling the heat. Shiva, though, didn’t slow his pace and as the bout eased towards the bell, he even showboated a little. Shiva eventually won the fight by unanimous decision. In another encounter, Devendro Singh edged past Kumar Beyong even though the referee had to stop the contest in the second round after he got injured through an accidental cut over his right eye. In a hard-fought clash, Devendro landed significant jabs from the first round itself. One of them even saw Kumar bite the dust. But he shrugged off the fall and got on with the game. In the latter stages of the second round, an attempted hook by Kumar left a deep cut on Devendro’s right eye and brought an end to the contest. But by then Devendro had sealed his win. “On a given day anyone can win, but I dominated from the start of the bout against this young boxer,” the injured Devendro said after his win. The biggest domestic tournament in boxing has a formidable field of 309 pugilists and will surely see a few come up the ranks as they rub shoulders with the country’s top placed boxers. The foreign coach of the senior national team and Chief Performance Director, Santiago Nieva agreed. “All boxers I have seen till now have been great but it is too early to say who will earn a call up to the national team. However, a local boy called K. Kranthi has caught my eye,” he said.